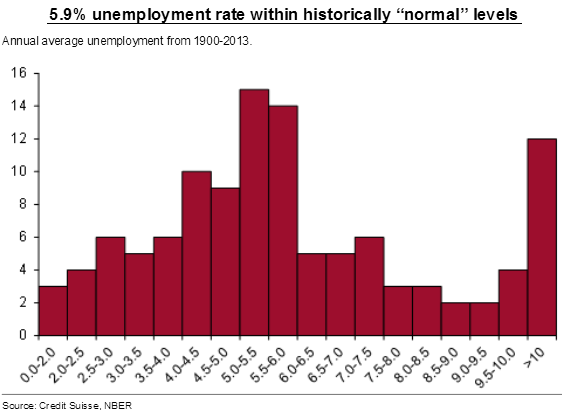 Sober Look: How close are the US labor markets to normalization? How close are the US labor markets to normalization? As discussed here back in April, US labor markets continue to heal, with Friday's payrolls gains putting 2014 on track to be the best year for job growth since the late 90s. Now many are asking just how far is the employment situation from "normalizing". Of course it all depends on the metrics used. The chart below for example shows that the headline unemployment rate is now well within the normal range (based on long-term historical data). But as we know, that's only part of the story. A broader gauge of unemployment, the so-called U-6 rate, which includes marginally attached workers and those employed part time for economic reasons, suggests the labor markets have some room for improvement. Within the U-6 metric it is particularly important to track the percentage of those employed part time for economic reasons. The current number of these workers (at just over 4.5% of the labor force) is not unusual by historical standards but is still quite elevated. It's not at all clear however if we are ever returning to the lows of the decade that preceded the Great Recession. Another measure of labor markets' health is an estimate of the "job finding rate" from Credit Suisse. At least based on the data since 1990 (which may not be a sufficiently long range), that metric is currently far below average. We do see signs of significant improvements recently but the red line in the chart below may no longer be our target for what is "normal". We've also seen a great deal of focus on falling US labor force participation rate. 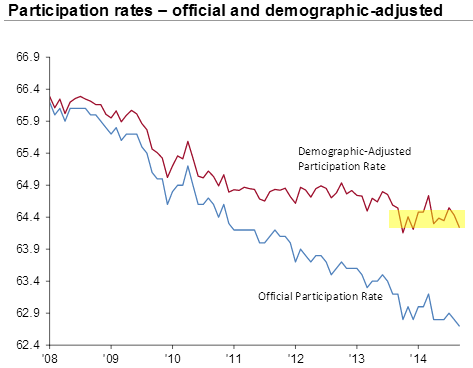 The non-demographic component of the post-08 declines in participation rate is of particular importance. How much is due to aging US population vs. the discouraged workers exiting the labor force? There are hints that the non-demographic decline in participation has been halted, albeit at a relatively low level. The fact that the non-demographic participation level has fallen doesn't say much about what it will take to return to "normal". That's because the pre-recession housing bubble had generated unsustainable demand for labor (particularly unskilled labor). 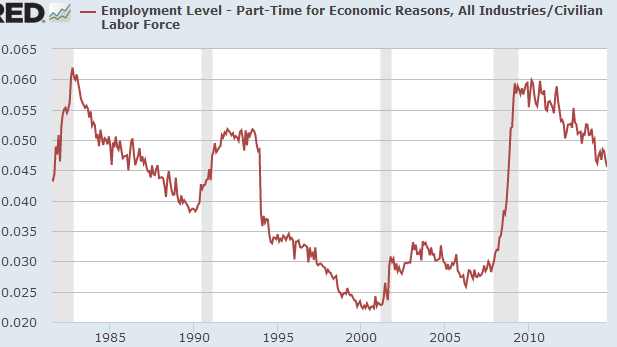 That demand isn't coming back any time soon as we look to establish the "new normal" in participation rate. We also see other factors impacting participation such as more disability claims and higher college enrollment rates. Finally we want to take a look at wage growth as an indicator of demand for labor. Wage growth in the US remains remarkably steady, anchored at 2% per year. While this growth is certainly weak relative to recent history, it is quite respectable relative to other developed economies. Once again, how far is wage gowth away from "normal"? Most economists believe that if payrolls continue to increase at the current pace, wage growth will improve. Perhaps. But we are unlikely to see sustained wage growth at levels the US experienced prior to the recession. Given weaker wage inflation globally (and wage deflation in a number of EU states), the 2% or slightly higher may be the new "normal". While many continue to insist that we are years away from normal labor markets in the US, it may be time to adjust our expectations. We could be much closer to the "new normal" than we had hoped.